There's been a lot of poring over history books at our house lately. And Mommy scrambling to try to answer a lot of interesting questions, like....should they have stabbed Julius Ceaser? And do the Greeks still not wear any clothes at the Olympics? They constructed a longboat. I wasn't sure if it was Saxon or Viking, but they had lots of fun with it. I think it was Isaiah's idea, and he wanted them to hang their shields on the sides. This picture was taken on a “low” day for me. As evidenced by me evidently giving in to the kid's requests for dry Ramen noodles and Mariam helping herself to a chunk of cheese. She is very pleased with herself for climbing into the babyseat/throne by herself, and possessing the independent riches of a hunk of cheese and dry ramen. She even has an adoring supplicant. I love this next progression of pictures, I was just trying to get an idyllic shot, and only later did I realize the little drama that unfolded. Its so representative of the kids personalities. Picture #1, idyllic scene of Isaiah reading to Mariam. Keziah looks bored. Picture #2, Keziah livens things up a bit. Picture #3, Jenny enters the scene, supporting Law and Order, and very aware of it. Keziah switches back to angelic smile. A couple years ago, I had tried to make my recycled ice-cream buckets (now holding flour, etc) more classy by spray painting them cream color. But then I ran out of spray paint, so a few of them still sport the logo “Party Pail” with garish colors. Jenny went through a brief nostalgic phase where she wanted to take pictures in black and white. This is a tree, she explained, as my initial reaction was I thought it was a nuclear mushroom cloud. They were very proud of their creation. Aunt Sarah came to visit for Isaiah's birthday, which pleased him greatly. 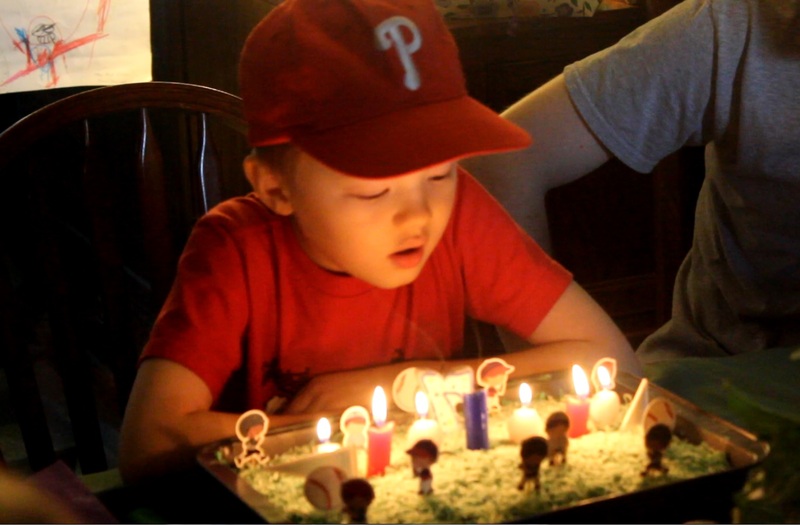 ...and a Baseball Cake. 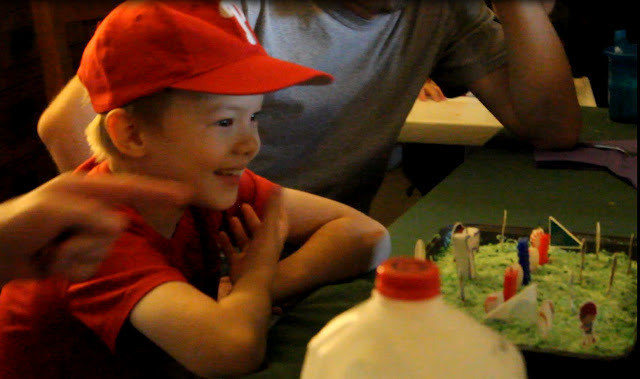 He was very excited about the cake. And attempts to keep the book to just her and Grandma. Thankfully, Grandma keeps reading, and Mariam moves to be able to still see the book. Bubbles fills Keziah's soul with joy. She wants me to photograph her bubbles, she is so proud of them. Right after this idyllic picture, Isaiah opened his mouth to reveal chewed up carrot. I think that plan had hatched in his mind in this picture, given the gleam in his eyes. Isaiah is extremely creative when putting together costumes. Often, the elements he sees as important in replicating something are not the ones I immediately see---he forgoes his Greekish-looking dress up helmet, and uses a yellow construction hardhat and red Megablocks to get the right silhouette. ....he then cleverly decided to use his discarded red shirt as his cloak. Keziah was inspired by our discussion of the Roman tortoise formation, and how the Roman soldiers would overlap their shields to make a kind of 2nd century tank. She decided she was going to wear ALL THE SHIELDS. She was very very proud of herself. Mariam, ofcourse had to photobomb. Isaiah loves his red clip on tie. At bedtime, I found he had added it to his pajama ensemble. Isaiah was reading, or at least recounting, to his sisters the fireman story from “What Do People Do All Day”. While wearing his fireman hat. (They re-enacted the story later, with Mariam being Huckle needing to be rescued by Isaiah being Smokey the Fireman). Josh found Keziah filling up little toy teacups with water at the sink to carry away. “You can't do that” he told her. “But we need to baptize the Duplos!” she explained. Josh went into the living room and found Jenny waiting with the unregenerate toy characters. He learned from her that they meant to sprinkle them. “Our children are evidently Presbyterians” he told me. Hi, um, we are doing science and still alive. So many interesting and fun things have happened, but I just haven't got around to putting them up on the internet. I wanted to post about all the adventures that I haven't yet, but the backlog is so great, I'm just going to try to post every week or so, with what's going on now. Josh got a telescope to look at Mars with the kids. Josh takes them out, one by one, to go out to look at Mars with Daddy. Isaiah has really warmed to this. The girls love the Barbie movie "12 Dancing Princesses", its a surprisingly good movie, with sibling love and teamwork, a very sweet future-brother-in-law (very nice to little sisters), and a talking Indian parrot who is very funny, with a soundtrack with a lot of Felix Mendelssohn in it and even 30 second's of the sisters singing Byrd's heavenly sacred choral music (best part). Anyways, the girls really love the film. They will hum the theme, while twirling about in their sundry dress up dresses with their hands over their heads, attempting a ballet stance. Sarah, at 18 months, dragged a dress up dress to Josh, and when he put it on her, started off-key humming and trying to twirl around with her little arms over her head (her arms are short enough they were stuck around her head). She almost immediately fell over, tangled in her dress up dress, but it just about killed me with the cuteness factor. Speaking of the 12 dancing princesses, we are well on our way, as baby #6 IS A GIRL!!! Our daughters, in addition to loving dress up dresses, make frequent use of the football pads I picked up at the thrift store. Keziah explained to me "I am a girl who fights BETTER THAN THE MANS. And they don't know I'm a girl because I cover up my skirt with my shield. And I fight better than all the mans"
I tried to subtley influence the kids into agreeing to a Lord of the Rings theme for Halloween this year, by drawing pictures of them in various outfits. Here they are, poring over the pictures of themselves. They loved the pictures, but it appears that Disney Princesses and the Roman Army have won their hearts for Halloween this year. Maybe my grand LOTR theme will happen next year. These pictures are from July, but my awesome little sisters got to visit. Here are some pictures of them. My baby sisters, all growed up. Sniff, sniff. So proud. The kids loved hanging out with their aunts, and wanted to do everything that they did. Here, it was working out with a new app on Mali's phone. I love how Mariam is carefully copying her. The girls were also very excited about Mali's ability to take selfies of them, and then decorate them with the virtual "stickers." While the girls were taking selfies, Isaiah hung out on the couch. He loves being near everyone, although selfies weren't enough to motivate him to join the crowd. Snapchat that turns your face into a dog with a huge tongue might have. Mariam's natural default is laughter. Even when she's frustrated at something “Mom, its NOT WERKING”, and I come over and show her she was trying to put the wrong foot into the shoe, or screw it on backwards, or something, she will burst into a musical chuckle at her mistake “Oh, hahahaha...”. She laughs so much, at herself, at life, at everything. She's a little ray of sunshine, a sliver of the joy of heaven. When my sisters were here, I finally got out my sewing machine and sewed the first thing this year, this Eowyn-inspired dress for my awesome Rohan little sister. He also asks me on a regular basis when his voice is going to change. With his head reaching my armpit, I wonder where the time went. Sarah Grace has got a loud, stubborn, dramatic disposition. If I am handing out treats, she will yell with a size-defying volume until she is properly included. At 13 months, she started toddling over at toothbrushing time months ago to get her 8 teeth ceremoniously brushed, beaming all the while. Then at water-time right after prayer, she will throw down her bottle she was drinking a minute before, and toddle over, yelling, until she gets a sip out of the cup like the big kids. It's a status symbol. When she started walking in earnest around 13 ½ months, she started making this smile, bursting with pride at her accomplishments in life. She toddled around throwing away stuffed animals, and throwing toys in the recycle bin, relishing her new-found autonomy. She started before she was a year old, and continues at 18 months, to pat me on the back for about a minute after I take her out of the crib every morning. There's something about a tiny little hand patting me on the back that just about melts my soul. She has also started to give spontaneous kisses.